Al-Bireh, Gaza (Exclusive): A gathering of women politicians, academics, and activists stressed the importance of the development of women's (female) intellect in the Palestinian context, which suffers from the impact of the occupation and internal division, and the necessity of the consolidation of the role and efficacy of the Palestinian women's movement, and working in an organized and efficacious fashion to strengthen the role of women in the Palestinian political system, and their participation in national dialogue and societal reconciliation. 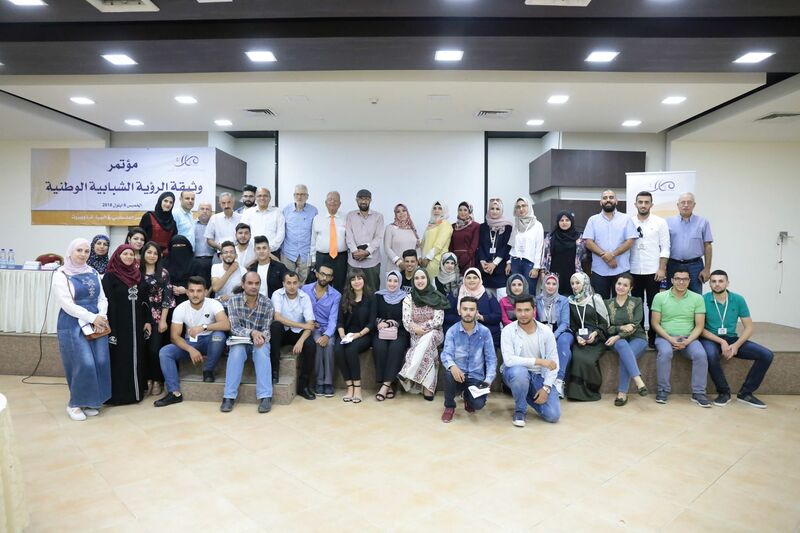 They also emphasized the importance of awareness raising and enculturation in the Palestinian society and among decision makers about the importance of the role of women and their participation with men in the various aspects of life, especially political aspects, and attaining their right to active presence on all levels in national institutions and parties. This took place during the women's peace table organized by the Palestinian Center for Policy Research and Strategic Studies (Masarat), in cooperation with "Peace Women across the Globe", in both of the Masarat headquarters in Al-Bireh (West Bank) and Gaza via video conferencing, simultaneously with the holding of scores of women's peace tables worldwide. The feminist activist, Lama Hurani, headed the table, while Shadia Al-Ghoul, the Coordinator of the Palestinian Initiative for the Promotion of Global Dialogue and Democracy (Miftah) in the Gaza Strip facilitated the dialogue in Gaza. At the opening of the table, Director of Programs at the Masarat Center, Khalil Shaheen, welcomed the attendees, and pointed out that this table is organized in cooperation between the Center and "Peace Women across the Globe" for the second consecutive year, and is dedicated to the discussion of the drafts of three policy papers on the role of women in the political system, national dialogues, and societal reconciliation, in addition to presenting concepts from a Palestinian women's perspective concerning such issues. He added: We hope to come up with recommendations that would contribute to the development of the papers and how to strengthen the role of women in the political system, their participation in putting an end to the division and the restoration of national unity, and the transition of women from the state of being "recipients" to the state of being "initiators". Palestinian author and literary figure, Dr. Fayha' Abdel-Hadi, the Regional coordinator of "Peace Women across the Globe", gave a speech in which she explained that the idea of the organization of the peace tables ensued after the holding of the global summit that aimed to end sexual violence in conflicts in London in 2014. She added that the goal of organizing the tables is to provide a platform for women and men to talk about the role of women in, and following, conflicts, in addition to the discussion of peace topics from a women's perspective. She pointed out that the 2016 peace table in Palestine is taking off based on what was achieved by last year's table, which addressed peace in the Palestinian liberation context from a women's perspective. Palestinian women are struggling to end the occupation, end the division, and achieve safety, a just peace, and gender equality. She posed questions such as: what do women require to have a louder voice? What is their role in the building of the political system and the achievement of societal reconciliation? What is their vision concerning the Palestinian liberation project? And how do they contribute to the departure from the state of the muted dialogue in light of the exclusivist and monopolistic approach? Dr. Abdel-Hadi expressed her hope that the peace table next year would be consummated with the participation of Palestinian women and men from the rest of the Palestinian populations in Palestine 1948, the Shatat (Diaspora) countries, together with the West Bank and the Gaza Strip, so their issues would be present in accordance with the particularities and conditions of each Palestinian population, thus enabling the building of common women's visions concerning the various issues and challenges. Lecturer and researcher at the Birzeit University Institute of Women's Studies, Rula Abu Dahu presented her paper, entitled: The Role of Women in Overcoming the Constraints against the Building of a Unified Democratic Palestinian Political System, which followed the approach of the antithetical and contradictory dualities in the discussion of the various contexts: the duality of the national general and particular, the duality of the patriotic and the feminist, and the duality of the feminist and the partisan. She elucidated that constraints facing women cannot be addressed without viewing the entire existent context in light of the colonial condition and the absence of sovereignty and independence, and consequently the impediment of the establishment of a society based on social justice, as women are a part of this condition experienced by the Palestinian society. Based on this, complex class, national, and social oppression and injustice constitute a central obstacle against the activeness of women in the public space to contribute not only to the building of a democratic system, but to the basics of integration in the general Palestinian context. She added that the problematic relationship between the feminist, national, and partisan aspects constitutes an additional basic constraint against the contribution of women to the establishment of a unified and democratic political system that strengthens steadfastness and resistance to achieve independence, sovereignty, and social justice. Without linking resistance to oust the occupation and the viability of the Palestinian society, there are no chances for a unified democratic political system. There is no room for either men or women in such a political system that is governed colonially in accordance with the will of the occupation, which needs to be shattered first. In her commentary on Abu Dahu's paper, ex-Minister, and Deputy Secretary General of the Palestinian Democratic Union (Fida), Siham Al-Barghuthi, indicated that it was a comprehensive paper that diagnosed the Palestinian actuality, and explained that women are part of the national fabric, and that the obstacles they face are the very same that everybody is facing, while the most significant obstacle facing the building of a democratic Palestinian society is the Israeli occupation and its practices on the ground. The central task is disposing of the occupation then ending the division, in addition to the disposition of the male chauvinist culture. She also proposed a number of points that aimed at the development of the paper, especially in terms of the importance of addressing the issue of national representation and the Palestinian Liberation Organization (PLO). Wafa' Abdel-Rahman, Director of the "Filastiniyat" organization, presented her paper, entitled: The Strengthening of the Participation of Women in National Dialogues, including the Dialogue on the Bases of Political Partnership and the Social Contract Between the Various Political Currents that Accept the Concept of Partnership. She intimated that the declaration of independence document is suitable as an epitome of the national dialogues on the bases of partnership, since they outline the features of the Palestinian political system and the bases upon which it needs to rely, in addition to the lucidity of the principles that institute that system. It constitutes a social contract for the system of governance and the character of the society, and it only lacks the details of the devices of its realization, particularly concerning the alternation in power, arbitration in conflicts, and protection of marginalized groups in conflicts. She indicated that women have been excluded from the most important Palestinian political decision making positions, and while it is true that they barely participate in dialogues that produce the present and future of the national cause and project, yet have they made the initiative to constitute a breakthrough of such bodies and components of their visions in all issues being addressed on those tables? Such a breakthrough requires resisting male dominance and challenging the patriarchal system. She broached the issue of exclusion of women from the reconciliation agreements on the official level, yet there are several civil society organizations that have been active in presenting initiatives to restore unity. Perhaps the most significant of such unofficial efforts is that by the Masarat Center, as it not only involved women in the dialogues, the writing of papers, and the commentaries, but has developed documents of reference that can institute and respond to many of the "landmines" in the official reconciliation agreements that were reached between the Fatah and Hamas movements and the rest of the factions. The involvement of women in the "Masarat" efforts was not limited to independent participants. The national unity document formulated by the Masarat Center could be the gateway to a national women's dialogue. Director of the Community Media Center in Gaza, Andaleeb Idwan, commented on this paper, and stressed the role of Palestinian women and women's organizations, and their initiative to take to the streets to end division and restore national unity, as they were the first on the street, before men, where they launched many initiatives to strengthen unity, such as the national campaign for reconciliation initiative, which persisted in its call for ending the division over the course of two years (2012-2014) until the signing of the "Al-Shate' agreement". Researcher Hidaya Sham'on presented her paper, entitled: The Development of the Participation of Women in Societal Reconciliation and Transitional Justice in the Palestinian Context following Nine Years of Internal Division. She stated that the paper focuses on two main axes. The first axis is the concept of societal reconciliation, and some of the community and women's efforts to achieve transitional justice with focus on women's efforts in this regard. The second axis is a future vision for the development of societal reconciliation in the course of transitional justice to contribute to the manifestation of a vision that could improve intervention in the future in the various levels of societal reconciliation, and the involvement of all Palestinian women, in their diversity and their various strata and generations to have an active role. She emphasized the necessity of supporting the establishment of a national women's body to take charge of societal reconciliation, as many committees had emerged through a continuous effort by women's organizations, civil society organizations, and community leader associations (makhateer associations). Yet there is a need to involve women, or their assumption of an initiative with support from all parties to institute the mechanisms of transitional justice in societal reconciliation. Hence the paper recommends that this body or coalition would manifest its vision and focus on societal reconciliation through its future strategic action, and planning in practical terms for the contribution in the updating and consolidation of the mechanisms of transitional justice to attain societal reconciliation. She added: Ending division and societal reconciliation is a role for women and men alike, and not merely women, as unifying and collective action is what is required, and the role of Palestinian women and their ability to mobilize around the issue of societal reconciliation from the first moment of the division is evident, despite all of the political exclusion and marginalization attempts that women have faced. She called for the establishment of an observatory for positive practices in the culture of societal reconciliation that would strengthen the culture of women's and human rights and emphasize the concepts of civil peace, values of tolerance, transparency, national dialogue, and anything related to the efforts to achieve societal reconciliation. 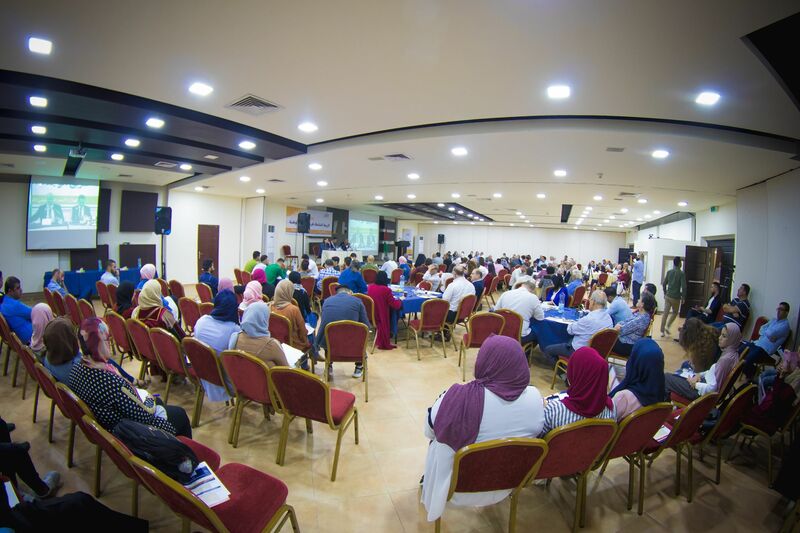 The Executive Director of the Aisha Association for Woman and Child Protection in Gaza, Reem Freineh, commented on this paper and explained that the occupation and its measures are the foremost causes of the occurrence and deepening of the division. She wondered about the priorities of the women's movement as part of the consequences and residues of the division, and how such ramifications would be addressed and who shall support them. She explained that the issue does not halt with the people, as the Palestinian people is one of the peoples that sacrifices the most, yet when it comes to loss, the issue needs to be addressed. The opinions of the attendees ranged from the call to women taking the initiative to assume their patriotic role and impose the political and women agendas upon the various Palestinian national institutions, to the transition from the state of reception to the state of production and initiative, to the call for conducting women's dialogues to come up with a unified opinion of women that defends them and their political and societal rights, through the rejection of the clannish dimension based on patriarchy and the exclusion of women, and raising cultural awareness in society and the family about the importance of the participation of women in the political system and decision making, to the consolidation of their role in parties and the various national institutions. The participants called for the unification of the efforts of women and the building of an efficacious women's movement that does not abandon ideological and political plurality, and the initiation of a dialogue with all women from the various tendencies, especially women from the Islamic movement, in addition to the importance of strengthening the mass character of women organizations via the establishment of alliances among them. 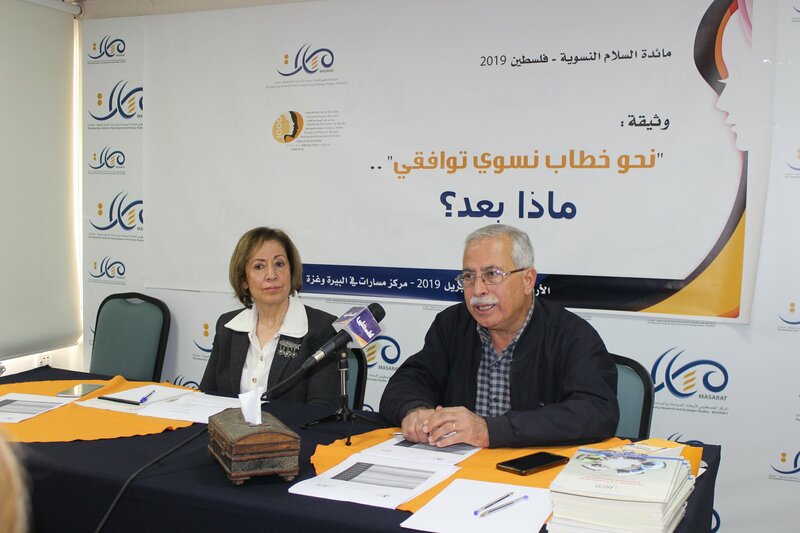 The table came up with recommendations, including the development of the papers in light of the remarks, in addition to the preparation of studies about the experiences of different peoples in transitional justice, and the role of women in the Palestine National Council (PLO) and other national institutions.